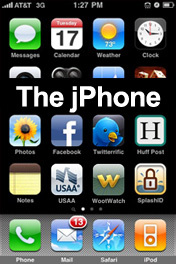 iReview the iPhone…Because it saves me money! I had already counted on commuting time (45 mins each way, M-F) but every day something else seems to pop up. Today it was the 25 mins. waiting in the dentist’s chair, and yesterday it was the 15 hours or so (it seemed) waiting in line at the Post Office. But having your trusty friend there by your side keeps you productive! The iPhone = time saved = money saved. Now if I’m just playing games then obviously it’s not saving me any money (in fact, it’s doing the opposite – all those Yahtzees & Monopolies downloads add up!) BUT for the most part I’m good. 90% of the time I’m checking personal email, work email, Facebook, Twitter, my 100+ financial blogs I subscribe to – and that inspire the pants off of me!, The Huffington Post, WSJ, you name it. All things that generate money in the end by making me more productive and saving me TIME. I know some people don’t consider that “saving money”, but in this particular case I do since it then frees up extra time to work on my blog, or jump on other projects that could be bringing in revenue. Also, if you’re one to pay bills online (or you’re one to forget to pay the bills! ), having apps at your fingertips helps you to knock it out the second you *think* about it. This, along with having most account #’s on hand (by using other secure apps), definitely helps you avoid late fees and save more money in the long run. I would also like to add that having rollover minutes is awesome! It has nothing to do with the iPhone itself, but it’s a helluva reason to like AT&T more (which you’ll need in a second). Not only can it cut down on your overage charges, potentially to ZERO, but you don’t have to check it every week just to make sure you’re still on track! The iPhone can iSuck though. The iPhone runs on AT&T which, as everyone knows, charges you up the a$$ to be able to use it (Plus, their coverage isn’t all that great – Verizon’s “there’s a MAP for that” campaign really was pretty accurate! Even if they’re getting sued for it). You’ve got the $30 unlimited internet package that’s mandatory PER phone, the $15-$30 text packages, and then you’ve still got to add in the normal “calling plan” package so you can actually call people ;) Mix in the costs of the phones now – $99-$300 all depending on what model & size memory you want (I picked up the 16G one (in white) for $200, while Mrs. Budgetsaresexy picked up the 3G model for $99 in black – with a hot pink case), and you’ve got your hands full. We now pay roughly $170 a month – a good $40 more a month than we did on Verizon. USAA, Twitterific, SplashID, WootWatch, QuadCamera, Huffington Post, Yahtzee Adventure, GoDaddy, iGarageSale, Starbucks Card, PhotoSwap, and Facebook. So you have the pros, you have the cons, and you have the apps. Is it all really worth it in the end? For me, absolutely. I get inspired more, connected more, I take better pictures (and now video! ), and it’s just so much easier & faster to manage my online life now. Yes, it’s more expensive than the other phones, but if you can afford it and maximize the potential (for all you other bloggers & online entrepreneurs out there), you’ll *easily* get your money’s worth in no time. Hell, just finding a single major discount while in a store can do the trick! I have yet to do it myself, but I know plenty of friends who have :) There’s no doubt about it, the iPhone is killer. It’s not for everyone, but it certainly makes my life a lot more easier. PS: If you ever want to take a screen shot of your iPhone like I did above, just press the HOME button and the Sleep/Wake (on/off) button at the same time & it’ll save a copy of it right there in your photos. Previous post: Net Worth: November – Slap on 7 More G’s. Next post: What’s your biggest financial fear?